The creator of Mario and Zelda loves its control scheme. As far as legendary game creators go, Shigeru Miyamoto of Nintendo is pretty high on the list. He designed games that have become synonymous with gaming itself- Super Mario Bros., The Legend of Zelda, Ice Climber. Ok, maybe not that last game, even though it is a classic. But upon playing Rovio's mobile game hit Angry Birds, Miyamoto was extremely impressed with how fun the simple control scheme was to play. So impressed, in fact, he was jealous he didn't come up with the idea first. "I have very much enjoyed Angry Birds, especially the way in which it combines traditional and new game elements in exciting ways," Miaymoto said. 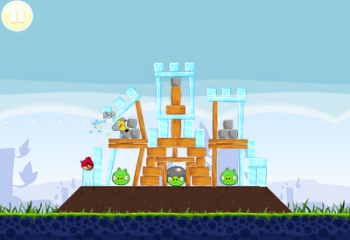 "Angry Birds is a very simple idea but it's one of those games that I immediately appreciated when I first started playing, before wishing that I had been the one to come up with the idea first. "I mean, obviously I want to be the one creating the most convincing, surprising game ideas," he continued. Miyamoto went into detail about why the control scheme works so well in Angry Birds. "When you analyze it, the controls are actually quite fuzzy in terms of the way that it works. It takes a little while to get used to the controls, I think, but once you've mastered them, you have a lot of precision. To make it the interface and controls work that well and intuitively, well, I think a lot of work went into getting that right." Despite his praise of the game, Miyamoto's pretty sure that iPhone is an inferior platform to begin with. "Obviously, if the developer had created the game for Nintendo DS the controls would have been even better, but what can you do?"